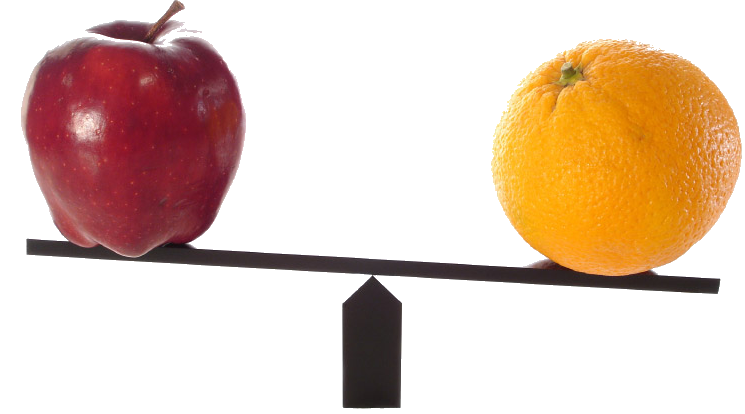 During the last few years we published several Enterprise Hypervisor comparisons and we got very positive comments and feedback on it. With the release of vSphere 5, XenServer 6 and a service pack for Hyper-V it was time for an update. It very interesting to see how some of the products have improved over the years and how the three major manufacturers look at each other and copy features. But you can’t trust all manufacturers by just a simple green checkbox. Some claimed features need third party add-ons, aren’t suitable for production workloads or are only supported on a limited set of operating systems. You have to investigate further and I hope I’ve done most of that work for you with this new enterprise hypervisor comparison. I have spent hours collecting information on vSphere 5, XenServer 6.0 and Hyper-V 2008 R2 SP1. 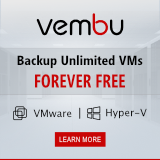 Not all information is easy to find and some of it is even contradicting but I checked, double checked and the VMGuru-crew did a full review so I’m pretty sure the information is 99,9999% accurate. 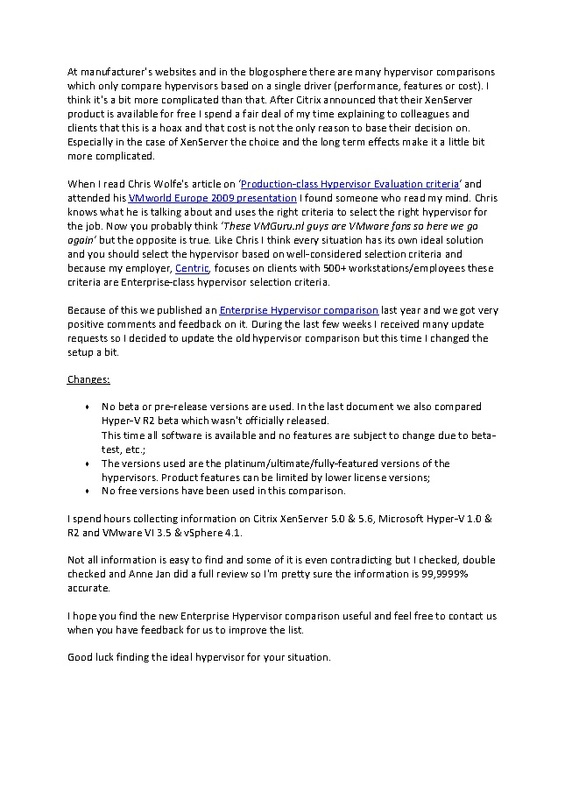 I hope you find the new Enterprise Hypervisor comparison useful and feel free to contact us when you have feedback for us to improve the list. In this version I added 15 new criteria. Many of these criteria should, in my opinion, be available in hypervisors suitable for enterprise environments. 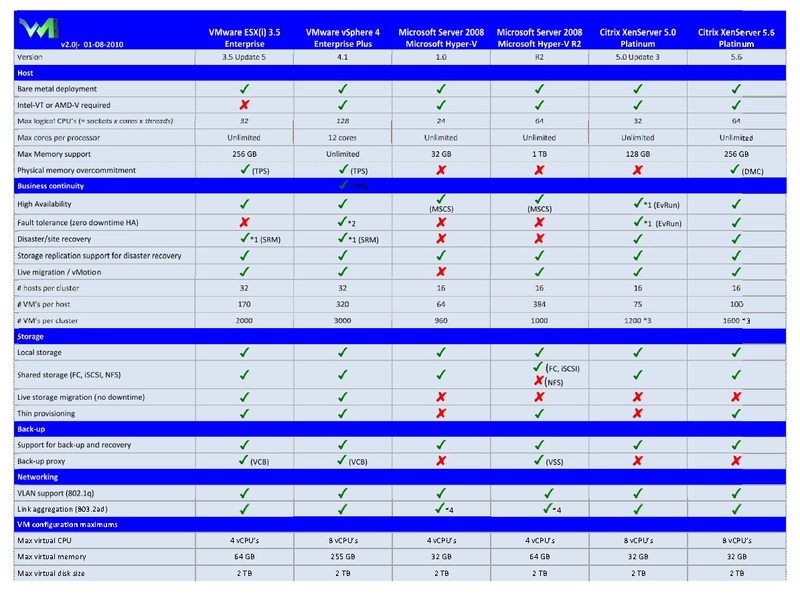 You can find my updated Enterprise Hypervisor comparison here. Last update: August 27th, 2013. Nice guide! Though I see some issues ? 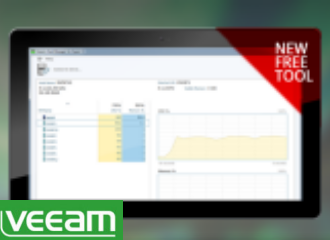 vSphere 4.1 has Storage I/O control and Network I/O control. ESX has supported hot add of disks going back to 3.0 at least I believe. Live storage migration (storage vmotion I assume?) is also of course present in vSphere 4.
ou’re absolutely spot on. Thnx. Regarding the long distance vMotion, that was tested with vSphere 4 indeed but not native VMware technology. don’t see them in large scale enterprise solutions any time soon. You’re absolutely spot on. Thnx. And KVM …….? I don’t think I will add that any time soon. Yesterday I also received a question regarding OracleVM but in my every day job I get absolutely NO requests on those two. They’re good niche players but I don’t see them in large scale enterprise solutions any time soon. Besides that, it’s a lot of work gathering all information, checking and double checking it. And even than an error slips in. In this setup, with three of the most popular products, I can manage to publish such a document regularly but when I add one or two more I just can’t manage to keep it up to date. I agree KVM is not yet there for enterprise stuff but from a scalability standpoint it seems to blow the others away, making it more on par with vSphere, or better in some cases. With the recent licensing changes in vSphere and the Open Virtualization Alliance I think it will be a force in the not too distant future. But I do understand keeping tabs on all that stuff is a lot of work!! please check – i think you are mix notes 2 and 3. This is an absolutely wonderful resource to have and I, as I’m sure many, many other, thank you for all of your time and efforts. I have one suggestion going forward and that’s to include a brief description of what each comparison item is. I know with my first pass at this documents I didn’t fully understand all of the items that were being compared. Forgot to add Apple OS support for Esxi 5. I did not forget it, I chose not to mention it. Apple OS/OSX is supported but requires Apple licensed hardware to run but as of last January, Apple seized producing the only Apple server that VMware vSphere 5 is certified to run on, the Xserve 3.1. Besides that, there are many more operating systems out there that vSphere supports but I chose to select the ones which I encounter in enterprise environments. This is fantastic. Thanks for taking the time to put it together. There are a few errors in this document with regard to networking. XenServer 6.0 ships with Openvswitch and no version of ESXi supports LACP for link aggregation. OK, XenServer 6.0 ships with Openvscwitch. And your point is ….? I’m looking forward to see RHEV included in the comparison. I’ve updated the comparison earlier this year to include RHEV. It’s in another article. What about RHEV? a chance to see it compared too? Hi Manlio, I’ve updated the comparison earlier this year to include RHEV. It’s in another article.